Pumpkin Pie- Vanilla frozen custard blended with Four & Twenty Blackbirds pumpkin pie and topped with whipped cream and spiced pie crumble. Christmas Cookie- Sugar cookie frozen custard topped with whipped cream and red & green sprinkles. Chocolate Peppermint- Chocolate frozen custard blended with peppermint and topped with whipped cream and chocolate peppermint candy crumble. All of the shakes at Shake Shack are spun fresh daily. Their vanilla and chocolate recipes use only real sugar, no corn syrup, and milk from dairy farmers who pledge not to use artificial growth hormones. 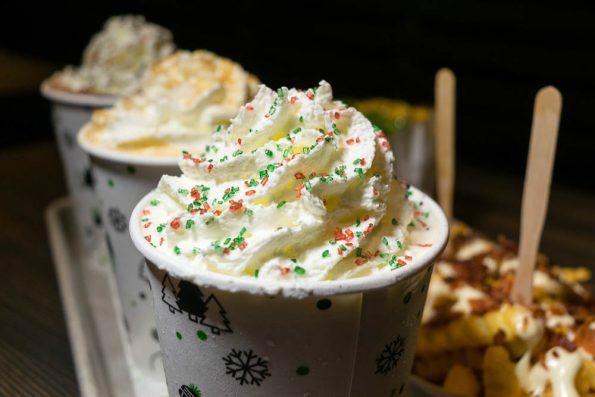 We recently took a break from the hustle and bustle of the holidays to visit our local Shake Shack to try these new seasonal shakes. All three flavors are deliciously reminiscent of the holidays. Each shake is holiday bliss in a cup! The 3 flavors mean that there is something for everyone. We both liked different shakes. The attention to quality that Shake Shack is known for, is apparent in all 3 shakes. Double ShackBurger- Double cheeseburger topped with lettuce, tomato, and ShackSauce. No hormones or antibiotics are ever used on Shake Shack’s burgers. Their proprietary Shack blend is freshly ground and all burgers are served on a non-GMO Martin’s Potato Roll. Chick’n Shack- Crispy chicken breast with lettuce, pickles, and buttermilk herb mayo. Shake Shack uses 100% all-natural cage free chicken. No hormones and no antibiotics are used. Like the burgers, the Chick’n Shacks are served on a non-GMO Martin’s Potato Roll. Bacon CheddarShack Fries– Shake Shack’s signature crinkle-cut fries topped with smoked Niman Ranch bacon and Wisconsin aged cheddar cheese sauce. We hadn’t been to Shake Shack since the Kierland location opened. We really enjoyed re-acquainting ourselves with their food. The quality of the ingredients used to make each item really shows. This creates an elevated fast casual experience. 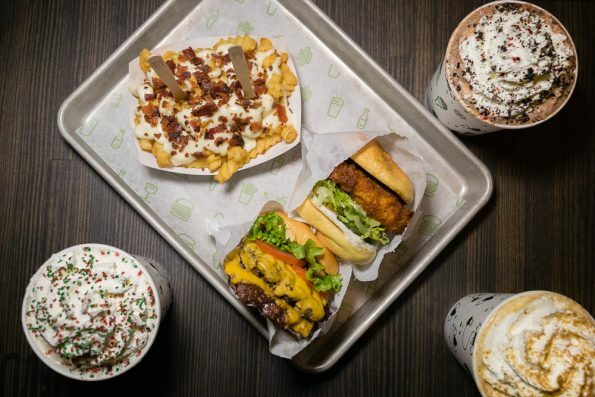 Shake Shack is definitely going to have a place on our casual date night list. Have you tried the new seasonal shakes at Shake Shack? Which was your favorite? Share your photos on Instagram and use the hashtags #GeekEats and #ShakeShack. Happy Holidays!